I bought this for my 18 month old toddler boys room. I love it because it feels masculine and will be a great light even when he is a teenager. I love this light so much I almost bought for my living room too. Light bulb type: Incandescent, halogen or LED. 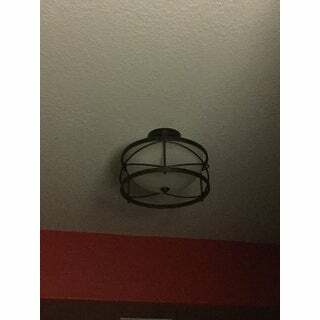 Dimensions Fixture: 15 inches in Diameter x 10 inches H; shade: 12.6 inches in Diameter x 4.7 inches H; ceiling cap: 5.5 inches W x 1 inch H.
An original design. It’s more a bronze/black than a black. But the biggest downside for me is that the glass shade is not as large as in the picture. The picture shows the bottom of the shade even with the sides of the frame, with end fastening piece even protruding slightly. In reality the shade is about 2/3 of the size of the frame so it looks a little disproportionate to me. Since the fixture calls for 3 bulbs 3 60 watts were too bright while 3 40 watts were not bright enough. I ended with 2 40 watts and 1 60 watt bulbs in a soft white. Made the finishing touch to the entty with a 8ft ceiling. I will be installing this in my foyer. I love this because I feel this works as a transitional piece. This feels like a high quality semi-flush mount and am very happy with the price. Beautiful light fixture. Easy to install and has updated the look of two of my hallways in my home. The light gives a warm shadow on the ceiling which adds to the ambiance of the hallway. I would highly recommend this fixture. we installed this in our hallway and we really like it's simplicity as it reveals a nice transitional feel for our country home. 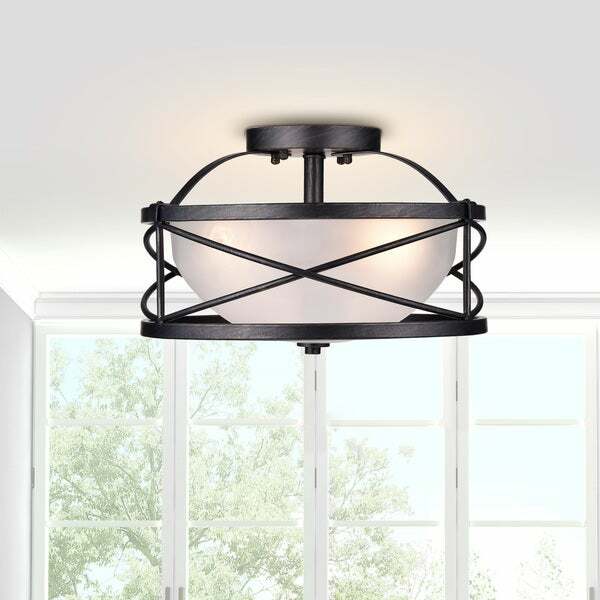 It blends nicely with other black or wrought iron fixtures we have throughout the house. The light was pretty easy to install (only took a few hours) and looks great in the room. We chose to put low wattage light bulbs in it as it was rather bright in our bedroom and even with the smaller bulbs it was still very bright. This fixture looks beautiful in my entryway. I am very pleased with the quality. In spite of the fact that it uses the smaller bulbs, it floods the area around it with light, which is a major improvement from the previous fixture which was quite dim. It seems very well made and very happy with the purchase. I was able to assemble it myself (and I am not a very hands on type of person) the electrician will be installing tomorrow and I am hoping I like it as much when it is turned on! We are building a new house and I purchased this light fixture for the laundry room. I didn't want the old traditional light fixture, but something unique and different. I am sure that this fixture will look great! I bought this light for a small mudroom. It is the perfect size and it looks so nice. I put LED bulbs in and now it gives off the perfect amount, and brightness, of light. Love my light, looks great in my hallway! Gives off a lot of light. Love this light. I would definitely recommend it. Although it is a nice product the photos are misrepresentative of the light. The glass globe part is in reality ,about one third smaller. The side steel “x” does not extend outside the unit, it’s much less predominant and much less a feature. This was the perfect addition to our modern farmhouse living room. It was a subtle add to the over sized globe we just purchased. Super easy install, up in literally minutes. I really like this light it’s very basic but has a little bit of style to it. I bought it for the hall but I think it will look better in the kitchen. The material of the ceiling light is great, it does not look cheap. I would highly recommend. I like the product, the screws included werevto short. Wanted 4 longer screws 2 for each light. Love this light very bright, exactly what I was looking for. Great quality! "Says semi flush but also flush. Is it sloped ceiling compatible?" This is semi flush mount. It is not sloped compatible. "Is the finish really black?" The finish is not really black. It's Antique Black(black finish with a light brush of brown). 50% is black, 50% is brown. "What does opal mean in the shade color description? I know opal jewelry, does this mean the shade will cast slightly colored light?"